In a Friday ruling, US District Judge Robert Shelby struck down Utah’s "agricultural operation interference" law, otherwise known as the ag-gag law, declaring it a violation of free speech rights. "Utah undoubtedly has an interest in addressing perceived threats to the state agricultural industry, and as history shows, it has a variety of constitutionally permissible tools at its disposal to do so," Shelby said in the ruling. "Suppressing broad swaths of protected speech without justification, however, is not one of them." In 2012, Utah approved a law that made it a class B misdemeanor to photograph or record an agricultural operation without consent from the owner. It also prohibited obtaining access under false pretenses, such as seeking employment with the intent to record or leaving a recording device at an agricultural operation without consent from the owner. Shelby cited several investigations, including one where activists filmed workers “forcing sick cows into the ‘kill box’ by repeatedly shocking them with electric prods, jabbing them in the eye, prodding them with a forklift, and spraying water up their noses,” Shelby wrote in the ruling. That investigation later led to the largest recall of meat in US history. 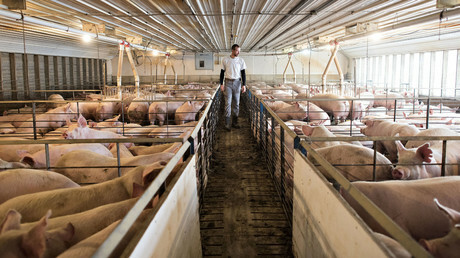 In 2015, the US District Court of Idaho also ruled that Idaho’s ag-gag law violated the First and Fourteenth Amendments. Both rulings were the result of lawsuits led by the Animal Legal Defense Fund (ALDF). The original lawsuit was filed by ALDF and People for the Ethical Treatment of Animals (PETA) after activist Amy Meyer became the first person to be arrested and charged under the law. In 2013, Meyer, the director of the Utah Animal Rights Coalition (UARC), was charged with violating the ag-gag law for filming a front-end loader moving a sick cow at the Dale T. Smith Meatpacking Company in Draper, Utah. She was on public property at the time, but the state still brought charges against her. However, the case was later dropped after public outcry.